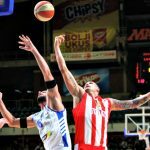 Crvena Zvezda stepped up in overtime and defeated Partizan at home (106-101) in Game 1 of the ABA League best-of-three semi-final series. 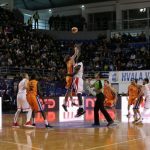 The game between the two arch-rivals from Belgrade was like a thriller. Crvena Zvezda was ahead but in the dying seconds of the game, Partizan’s guard Alex Renfroe made a lay-up to tie the game. Thereby forcing overtime (85-85). In that overtime, the teams kept each other in check until 96-96. But then Billy Baron (Crvena Zvezda) stepped up and scored nine of his 23 points in the final minute. 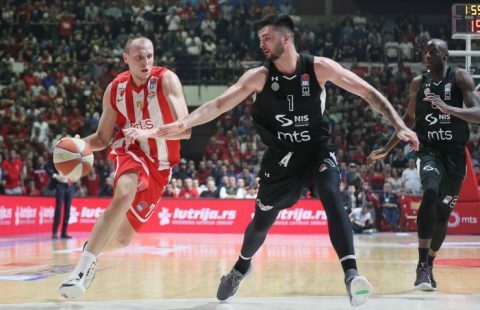 Partizan had no answer and couldn’t recover from a seven-point deficit (103-96) and, consequently, they were defeated. Aside from Billy Baron, Dejan Davidovac had 18 points and six rebounds for Crvena Zvezda. Also, Filip Covic contributed 16 points and nine assists. Vanja Marinkovic and Jock Landale posted 20 and 17 points, respectively, for Partizan. In game 2 Partizan will have the home court advantage. It is a must-win game for coach Andrea Trinchieri and his players. Otherwise, their ABA season is over. 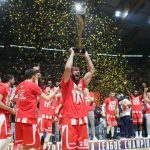 Both Crvena Zvezda and Partizan desperately need the ABA League title to secure participation in the 2019/20 EuroLeague season. This season both teams had to play in the lower ranked EuroCup. But that adventure ended in disappointment since they both failed to reach the knockout stage. Will Partizan be able to tie the series and force a Game 3? Time will tell. 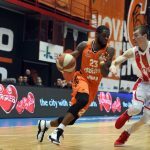 But if not, then their arch-rivals Crvena Zvezda will reach the ABA Finals again.